For regular and successful participation in a seminar, course or lecture, students are awarded a certificate (Schein). The grading system is made up of a scale of five grades, whereby the lowest pass grade is 4,0. For a successfully completed seminar or lecture, the foreign students receive ECTS-credits; these ECTS-credits will be recorded in an official transcript of records by the Office for International Relations. PLEASE NOTE: For 1 Nürnberger Creditpoint, 2 ECTS-Credits are awarded (Due to the local Credit-Point-System at the WiSo-Faculty). All transcripts and accreditation will be issued by the Office of International Relations. For language courses, the factor is NOT 2 but 1,5. If you take classes at other faculties (which is possible), ECTS-credits are awarded according to their own rules. ECTS was introduced during a pilot phase extending from the academic year 89/90 to the academic year 94/95. Five subject areas were selected for testing the ECTS mechanism: Business administration, chemistry, history, mechanical engineering and medicine. One faculty or department from each of the 145 member institutions of higher education participated in the scheme. The results of this pilot phase were encouraging enough to convince the European Commission to implement it as part of the in-coming SOCRATES programme, which will incorporate, re-structure, and expand the existing ERASMUS programme. ECTS is a decentralised system based upon the principle of mutual trust between participating institutions. The few rules of ECTS, which concern information (on courses available), agreement (between the home and host institutions), and the use of credit points (to indicate student workload), are intended as reinforcement of this mutual trust. Each ECTS department describes the courses it offers not only in terms of content, but also in terms of the credits assigned to each course. ECTS is a credit system based on student workload. Student workload refers to the time spent in lectures, internships and independent study. It includes all the work needed to prepare for examinations and to meet academic requirements. The basic allocation of academic credits in ECTS is 60 credits per year of study, 30 credits per semester, or 20 credits per trimester or term. It is important that no special courses be set up for ECTS purposes. All ECTS courses should be mainstream courses of the participating institutions, as followed by home students under normal regulations. It is up to the participating institutions to assign credits for the different courses relative to their workload. 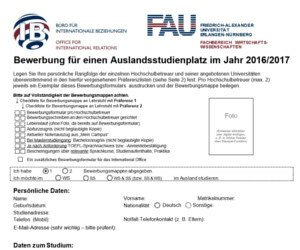 Please note: In Nürnberg there is a local credit point system for German students. The credit points awarded through this system are NOT identical to the ECTS credits! Internships (work placements) and optional courses are also assigned academic credit, but only if they form an integral part of the study programme. Non-credit courses may, however, be included on a student’s transcript. Credits are awarded only if a course has been completed, all requirements have been met and examinations passed. Students participating in the ECTS will receive full credit for all academic work successfully completed at any of the ECTS partner institutions. These academic credits may be transferred from one participating institution to another as long as there has been prior agreement between the institutions involved. All students participating in the ECTS pilot scheme will go to a host institution in an EU member state, study there for a short period, and then return to their home institution. Some may decide to stay at the host institution and finish their degree there. Others may decide to proceed to a third institution and continue their studies. In each of these three scenarios, students will be required to comply with the legal and institutional requirements of the country and institutions where they take their degree. When a student returns after successfully completing the study components agreed on in advance by the home and host institution, credit transfer takes place. The student then resumes his/her study programme at his/her home institution without loss of time or credit. If, on the other hand, the student decides to stay at the host institution and to take his/her degree there, he/she may have to adapt his/her study programme to comply with the rules of the host country, institution and department. As of now, the Faculty of Economics and Social Sciences has not yet entered into final ECTS agreements with ERASMUS partner universities. This means that students studying in Nürnberg will have to apply for recognition of work done once they return to their home institutions. Whether this recognition is granted will depend in many cases on the course description given to the home faculty. Therefore it is important that you clarify, with the help of the descriptive pages in this booklet, whether your university will accredit the courses taken here. You are advised to find out about course requirements from your home faculty before you come to Nürnberg, and whether they will recognise the programme of study you intend to follow here.